The June 18 death of Joe Deal was a deep blow felt throughout the photography world. A widely respected and much loved artist and educator, Deal will be sorely missed by his former students, fellow photographers, and legion of friends in the community. Although I never had the opportunity to meet Deal, I have long been an admirer of his work, particularly the photographs he made in Southern California in the late 1970s and early ’80s. Perhaps the fact that I grew up in Los Angeles in that same period makes me somehow predisposed to appreciate Deal’s work, but whatever the reason, I find the stark geometry of his photographs to be deeply, almost viscerally satisfying. As a small gesture to honor his passing I am posting some of my favorite of his photographs from SFMOMA’s collection. Each showcases the artist’s mastery of the challenging square format, his acute sense of design, and his lifelong interest in the Western landscape. 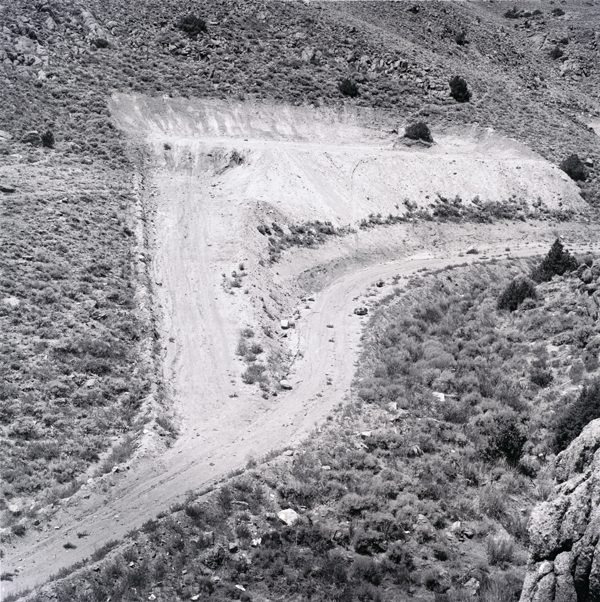 The photograph above is one of a selection of Deal’s early work, featured in our current exhibition New Topographics: Photographs of a Man-Altered Landscape (through October 3). The exhibition is a restaging of a 1975 show Deal was integral in shaping — he designed the original catalogue, devised the title, and assisted the curator, William Jenkins, with the exhibition’s conceptualization. Considered a seminal event in the history of photography, New Topographics brought together the work of nine photographers who shared a radical new approach to landscape. Like his peers in New Topographics, Deal trained his camera on landscapes that had been overlooked by the prominent photographers of the preceding generation, people like Ansel Adams, Eliot Porter, and Minor White. Instead of majestic, snow-covered peaks or meadows dotted with wildflowers, Deal chose to photograph places irrevocably marred by human hands, landscapes most people would consider unreedemably ugly, like the dirt road in Wyoming, at right. 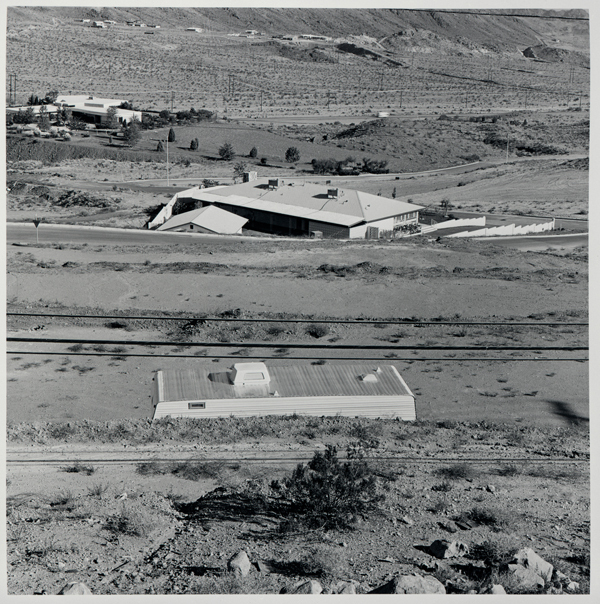 Among the artist’s favored subjects early in his career were sites graded for future developments, newly cut roads, mobile home parks, and all manner of shoddily built housing. Although he certainly felt they were eyesores, Deal deliberately chose to photograph these aspects of the built environment from as seemingly neutral a point of view as possible, as his interest was in visual analysis, rather than in conveying an explicit social or political message. The two photographs below are from his Fault Zone series, a group of photographs that are nominally about geology and land use, but are memorable more for their unconventionally beautiful compositions and design than for their subject matter. In a more recent series, West and West: Reimagining the Great Plains, Deal stripped his pictures down to the barest of bones: rock formations, grass, sky. 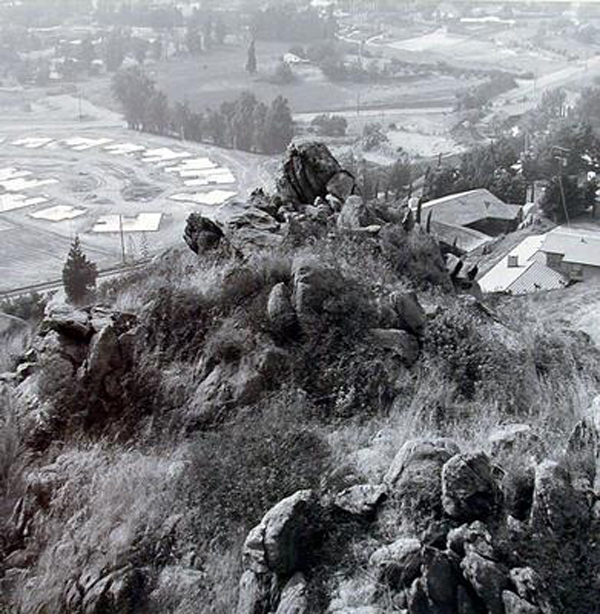 A return to the region where he grew up and a meditation on the constructed nature of landscape, it includes some of the sparest photographs Deal ever made. 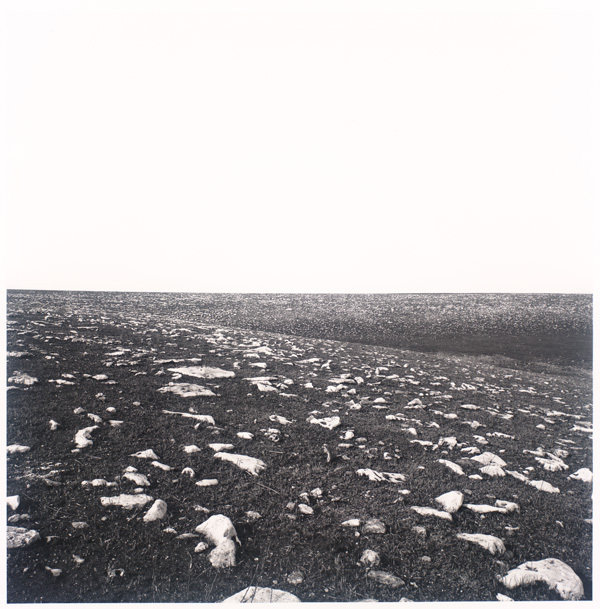 A standout from the series, Flint Hills, which SFMOMA just acquired, harkens back to pictures made for U.S. government surveys in the 19th century by photographers like Timothy O’Sullivan and William Henry Jackson, while simultaneously demonstrating Deal’s profound debt to minimalism. A deceptively sophisticated picture, it is a distillation of the stylistic and thematic issues Deal grappled with over his nearly 40-year career. 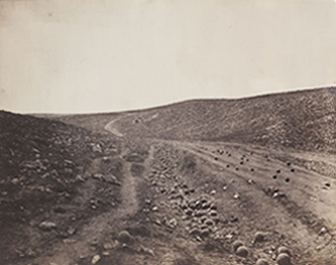 Deeply engaged with the history of the medium, Deal also nods here to Roger Fenton’s ominous Valley of the Shadow of Death, whose title alludes to the fierce battle chronicled in Alfred Tennyson’s 1870 poem The Charge of the Light Brigade. Just as Fenton’s photograph evokes the memory of a historically significant battle with nothing more than a road littered with cannonballs, Deal’s Flint Hills subtly suggests the complex geologic and social history of a place central in the American consciousness with only a field strewn with rocks. This hauntingly beautiful photograph is the work of a mature and confident artist made at the peak of his creative powers. For more about Deal’s life and career, see the thoughtful obituary that appeared in the New York Times soon after his death. It includes a slideshow featuring several more examples of his work. An undergraduate dual major in photography and art history during the late 1970’s, I remember sitting in Joe Deal’s classroom for a critique to which he had invited another faculty member at the University of California, Riverside. The guest was Edward Beardsley, at the time, my drawing teacher. Ed began to tell a story about walking along a beach and seeing something in the sand, and bending over to pick it up. It was a shell, beautiful in color, texture, line, proportion. His only reason for picking it up, he argued, was because of its physical beauty, its outward appearance. Joe then began to speak, in that softly persuasive well considered manner of his began to describe a parallel metaphoric beach that he was walking along. He saw something in the sand too, something that created in him an urge to bend over and pick it up. It had nothing to do with its beauty, he argued. Nothing to do with its shape or appearance. What could it be that compelled him we all wondered? “It’s because its a fossil,” he said simply. Of course. Any object, and subject, has the twin nature of its outward beauty and its inward truth. I have since often thought of his photographs as fossils, objects that have managed to capture history in their very being. I never heard him pass judgement on the subjects of his own work, although as a class, we had many debates about the nature of beauty, ugliness, and truth, and the role each had to play in the creation of art with lasting meaning. 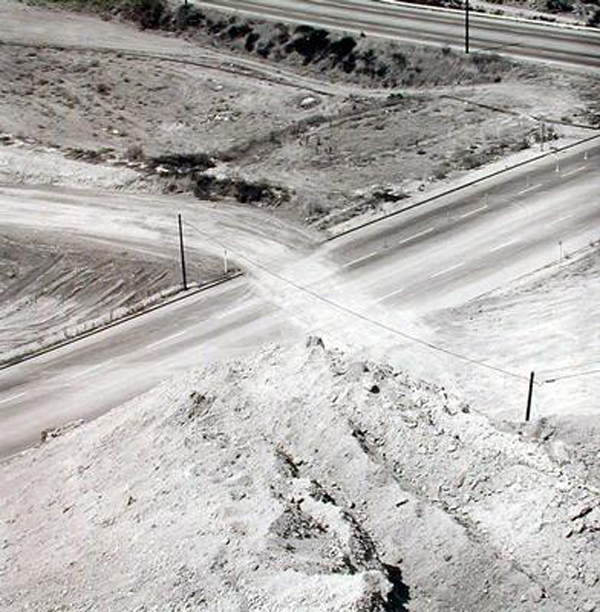 I found his work hard to look at then, just as I found it hard to look at the destruction of the beauty of the natural environment with each trip to Los Angeles along the 10 Freeway as another hillside was carved off and flattened for houses. He must have read my soul when as a graduation gift at my undergraduate ceremony in the summer of 1979, he handed me a signed copy of his most poetically beautiful photograph, Magic Mountain, Valencia California. Although it depicts a manmade creation, it is one that echoes the natural forms of the California hills that surround it and stands at the intersection of truth and beauty.